One of the common themes of my life, and that I could preach about 100 times and it would never get old, is the theme of VIRTUE. And the journey that I have had to always become more and more of a woman of virtue. 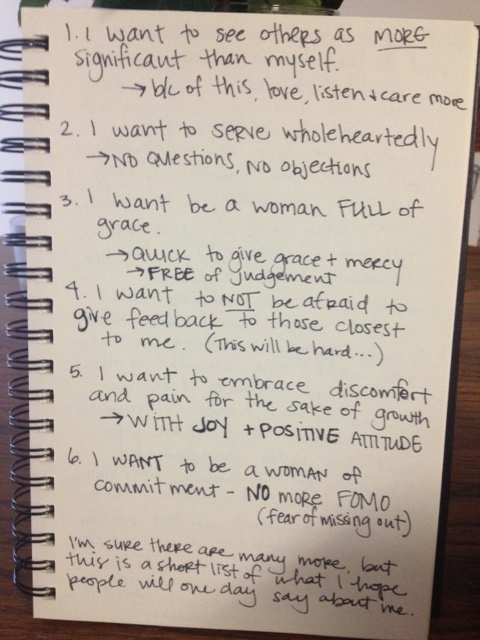 Two years ago, I started writing down the type of woman I wanted to be. I made decisions. I would articulate what was most important to me and I determined within myself to do whatever it would take to live by these virtues at all costs. Last week, I was thinking about this again. And it felt like my old list of virtues were somewhat distant and outdated. It felt like what I had decided two years ago had become so much a part of me, that I almost forgot how to be daily aware of these things. So I made a new list. It probably has the same heartbeat as my old list, but with fresh revelation and reminder to what I value. God began stirring some things up in my spirit at a Bible study and while I had no idea what was going on inside of me, it led to some incredible breakthrough with one of my closest friends. My sporadic verbal processing caused us to be honest and real with each other. We sat in the parking lot of our apartment for about 30 minutes talking, crying (just me), and praying. We gave each other the permission to say what we really see. We allowed room for much needed perspective so that we could reach depths of friendship rather than living in shallow proximity. You can live with someone and do life with someone, without ever letting them see you. And what a loss that would be. And so I am an advocate for everyone to know what is important to them, and to make a decision to live those things out. But be prepared for it to come to you in an unexpected, possibly messy, unorthodox way. I will be so bold as to say that it will be worth it. So that at the end of your life, that which matters most to you will be what people remember. Good blog. This is pretty much the same kind of stuff I have been going through lately. I can dig it. Hey girl– can’t get good enough Internet to post to your blog. But I love it and I love woman of virtue– reminds me of being at debrief in Ecuador two years ago. I’m leaving Ecuador tonight And am just continually blessed as I literally walk where y’all walked and speak my heart where y’all spoke yours. All y love to you and linds and Robby. Mucho amor desde Ecuador, and soon Peru. Bethany, you are….amazing. So thankful for your non-showy, quiet, yet sincere and deliberate pursuit of Him where the rubber meets the road. A good example that stirs us all! So I may be reading up on your past blogs, since you posted a new one today and I remembered how much I LOVE your writing. I can honestly say that what you shared after posting this blog in the months of march and april have really hit home for me right now. I can also say that I believe they came from you choosing to live out these virtues. Now I dont know if you have made a new list or not, but I can certainly tell you I believe you to be a woman of these virtues and I am honored to have started our friendship by being a pupil of yours on H squad and now to truly consider you a dear friend. For dear friends do not always have to be around each other 24/7 or know the deepest darkest things, I simply know that you will honor me by being a woman of high virtue and call my into higher virtue all along being open to me calling you into higher. Wow Mikala! Thank you so much! You never cease to encourage me and I am beyond blessed to call you my friend!! 🙂 Love you mucho!